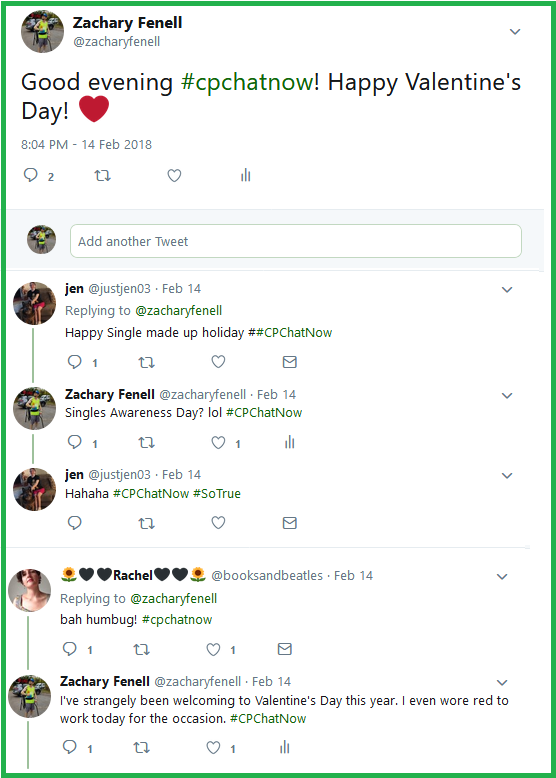 February 2018 coincidentally saw Valentine’s Day and the weekly cerebral palsy Twitter chat #CPChatNow fall on the same day. 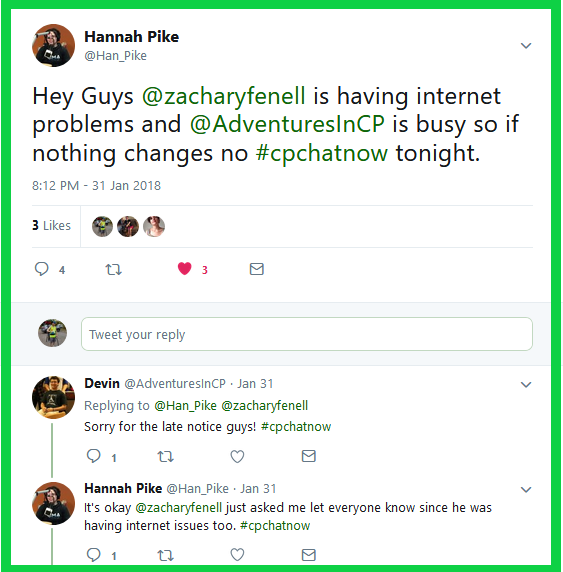 I am co-host Zachary Fenell, ready to recap the dialogue from February 14th. Participants’ attitudes towards Valentine’s Day emerged early in the chat. 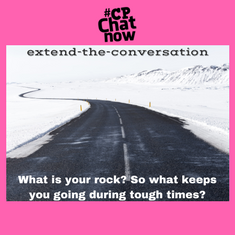 Chatter remained Valentine’s Day related via participants sharing their experiences with online dating. Unfortunately, the tales skewed more negative than positive. Disclosing your disability proving a key topic. 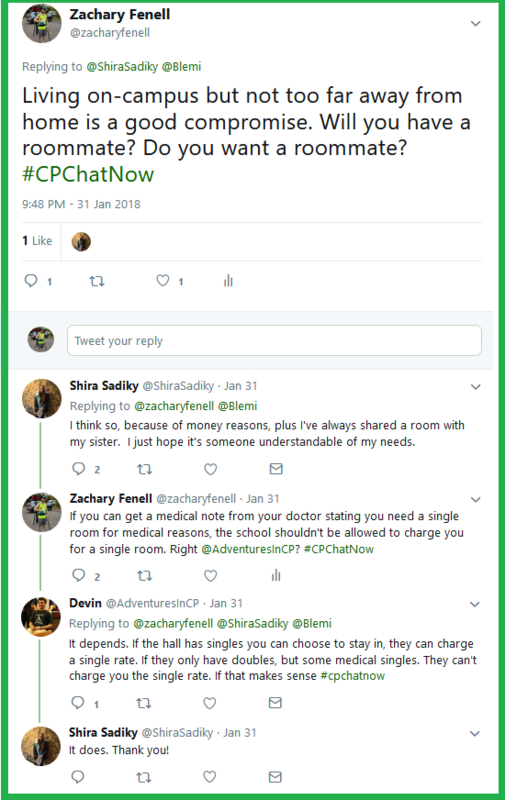 However, I will avoid specifics since the recap rules deem “Tweets focus on sensitive life events, such as relationship matters” not recap appropriate. Eventually discourse moved beyond a love theme. 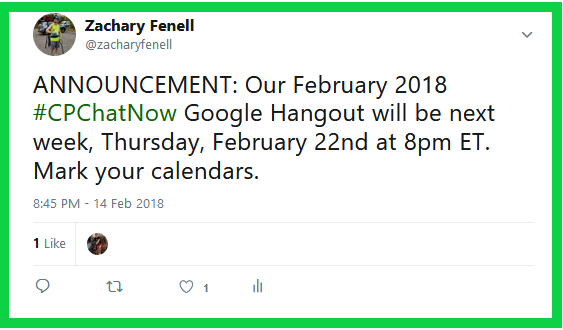 I announced the date for our February 2018 Google Hangout. 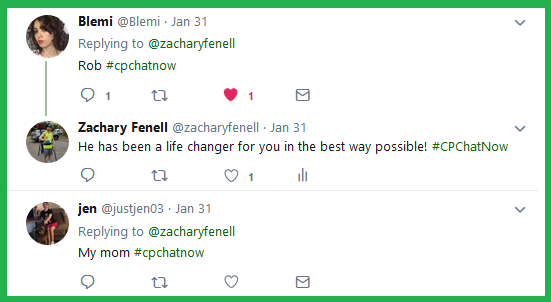 Google Hangouts offer the chance for us to talk face to face and share stories harder to tell with Twitter’s character limits. 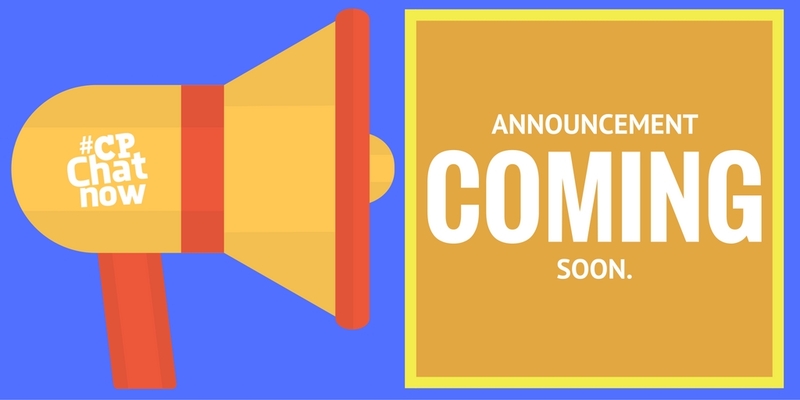 Distributing the Hangout link happens privately to ensure a safe environment. 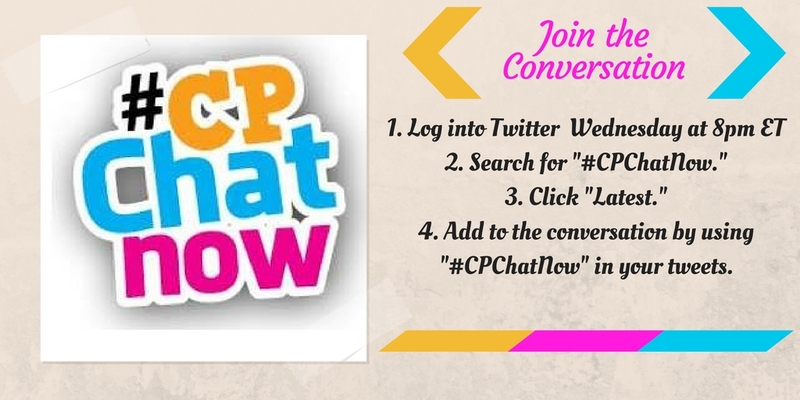 Please contact either my co-hosts Jorge Otezia, Devin Axtman, or myself by Twitter or through the #CPChatNow Facebook fan page to inquire about joining the Hangout. 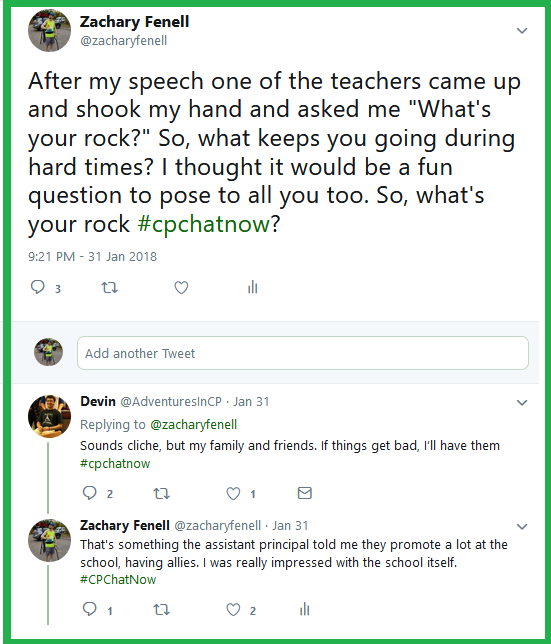 Mentioning Devin, he added input to a question I asked. 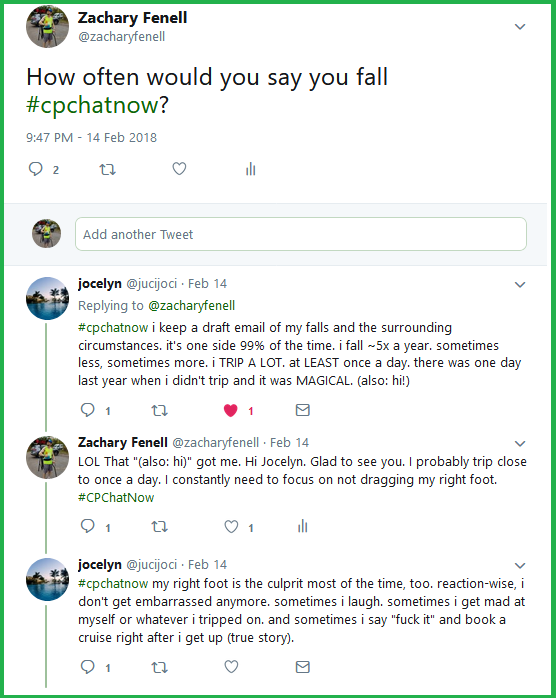 Devin answered my question, “How often do you fall?” He said he falls maybe once a month. 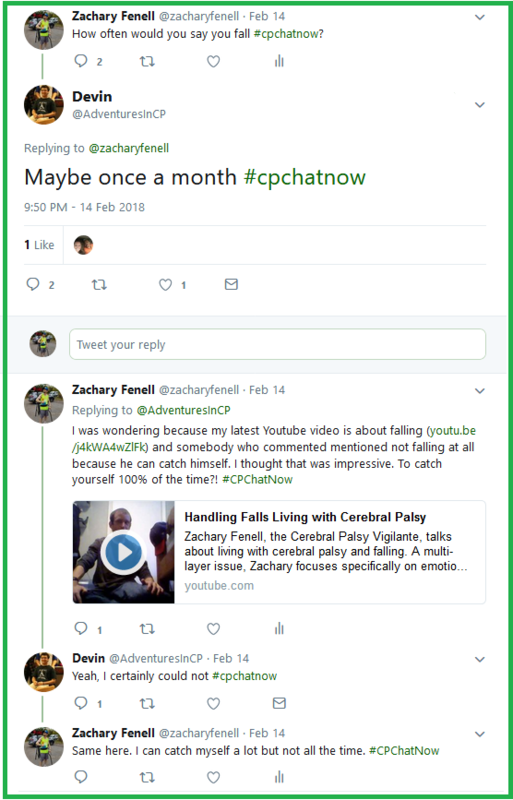 I explained the reason I asked, feedback I received on a recent Youtube video discussing falls. The user commented he never falls because he catches himself. Devin and I both found the ability to catch yourself all the time impressive. Long-time community member Jocelyn also added to the falling talk. Jocelyn possessed a more precise answer to the question “How often do you fall?” She noted tracking how often she falls and trips. Within the information she logs she includes the situation’s circumstances. Probably very helpful data! Your turn now. 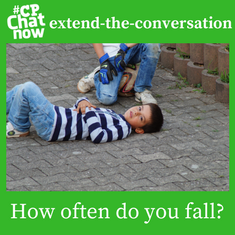 Answer for the week’s extend-the-conversation question, “How often do you fall?” Estimate if you do not know the exact amount. Leave your answer by commenting below.